Everything is provided for a pleasant stay, the house offers views of the Charente countryside conducive to calm, rest, invitation to a walk in the countryside or through bike paths. You will enjoy a private swimming pool 5m by 10m and secured by an alarm and surrounded by a sun terrace. In the town you will find, vegetables and organic bread baskets on demand and 10 minutes, shops, medical office, pharmacy and physiotherapy. Refrigerator, freezer, dishwasher, microwave, oven, washing machine, TV; barbecue, table tennis and mountain biking available. Sunbeds around the pool and terrace directly accessible from the house. Cottage in a quiet hamlet, close to several pretty villages and castles, but also 35 kms from Angoulême and 25 km from Aubeterre (one of the most beautiful villages in France with its monolithic church). Located in the Cognac country, in a quiet hamlet, independent, not overlooked, fully enclosed with a private entrance. Bakery, deli, shops, markets and supermarkets within 10 minutes but also leisure to 15 minutes (jet ski Guizengeard, gym at Brossac). A price of € 0.0932 at ht Kwh is requested, it concerns the electricity consumption off period of July and August (electricity included). Do not hesitate to send us a message for any further information. Very relaxing tranquil experience in the countryside. Very well equipped house very comfortable. Pool was fabulous. We got great weather. We were 16km from montmoreau , Chalais and barbezieux which all had lovely restaurants. We enjoyed the bikes and the walks around the area. The owners were very welcoming and helpful . We are planning to go back and I would not hesitate recommending this property. This is very probably the cleanest house/cottage we have ever stayed in, it was faultless. this accommodation offers a perfect getaway from all the stresses of everyday life. Thre is a large secure garden with a variety of fruit trees and shrubs which offer a shaded place to sit during the hot weather. The pool, although not heated, is exceptional for a refreshing swim or just floating about. The water is also kept crystal clear. The accommodation itself is immaculate with a modern kitchen featuring double sliding doors opening onto the patio with views across the pool and the garden. The hosts are charming, friendly and respect your privacy. I would have no hesitation in recommending this accommodation or staying here again myself. The pictures on this site really do not do justice to the whole property. It really is amazing!!!! Nette woning gelegen op een groot stuk grond. Veel privacy. Vriendelijke en behulpzame eigenaren. 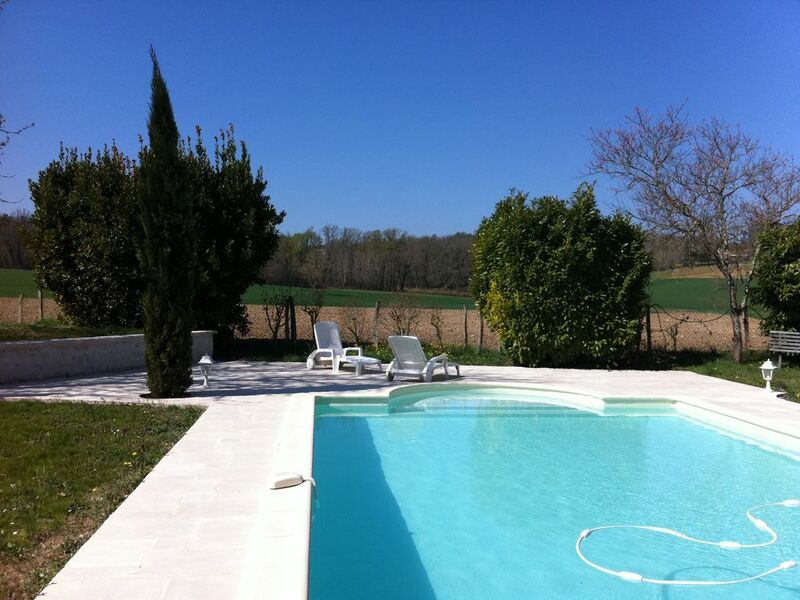 Une semaine de vacance tres simple a resumer : un grand jardin pour flaner, une belle piscine, une petite maison agreable a vivre et tres propre. Nous savons ou aller quand nous retournerons en vacance dans le sectuer. Un grand merci aux proprietaires qui sont tres sympas. In total we have spent 2 weeks in this place. Very peaceful, quiet location. Nice little house in the middle of the countryside. A bit isolated which contributes to the overall privacy. All basic accommodation is available with a magnificent swimming pool. Very friendly and supportive owners with a lot of respect for their guests. It’s a place we would certainly recommend without any doubt. Nous avons passé un très agréable séjour et reviendrons sans aucun doute . Pour toute personne supplémentaire, il est demandé un montant de 20 euros par nuit et par personne. Pour le ménage, un forfait est proposé à un montant de 70,00 €. En dehors de la période de Juillet et Août, la consommation éléctrique sera facturée aux locataires suivant un relevé à l'arrivée et à la sortie des locataires. Le montant est de 0,09€ ht par Kw.